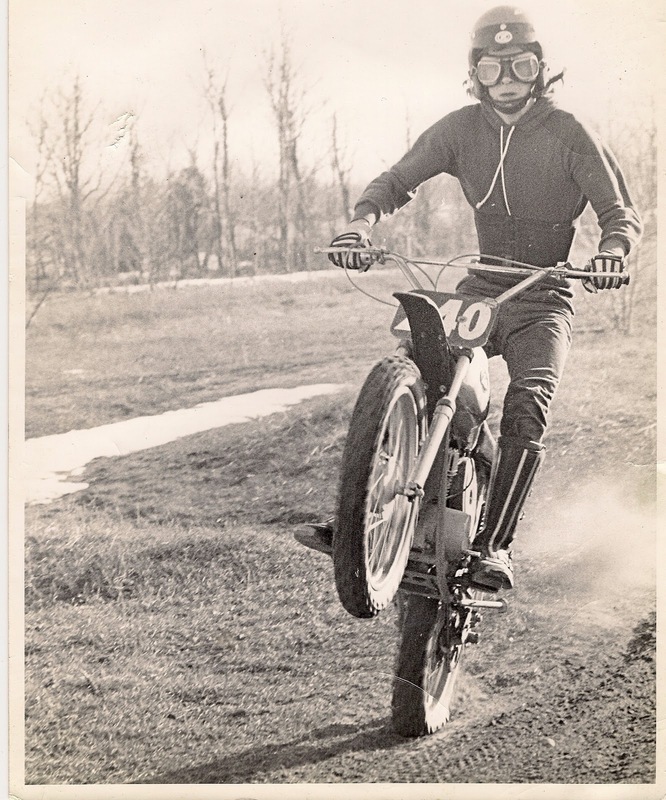 I started racing back in the Hodaka 90cc Superat days, 1968. 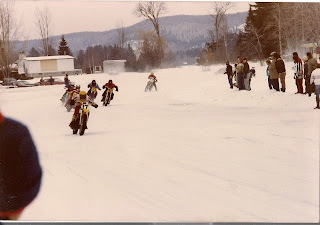 Racing motocross and ice was my passion till 1975.My sponsor Hal Young gave me a YZ125 Monoshock and gas money. WOW. 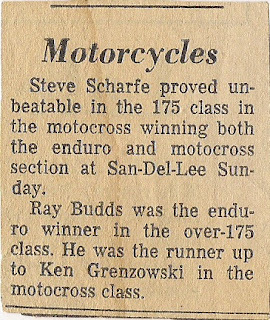 I was so grateful and inspired by this support that it helped me to win the championship that year in the Ontario Sandelee motocross series 125 Expert class. In 1978 George Pepper, who was the guy that kick started my interest in racing, sponsored me on a new TT 500 Yamaha, to race the nationals on ice. 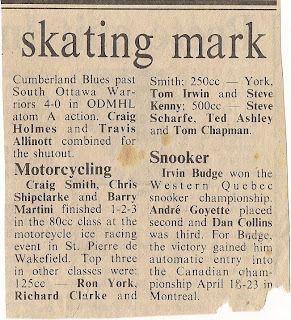 George had been Canadas #1 formula race car driver. 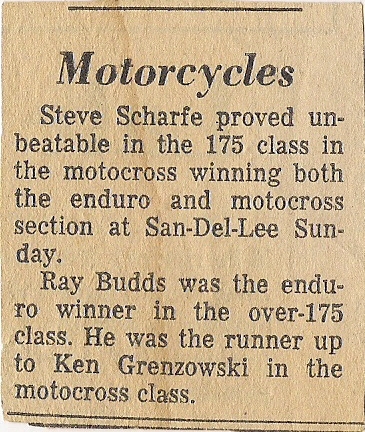 He promoted the first motocross race on the Scharfe farm. This was one of the best tracks at the time, and I got to work on my riding and conditioning in the back yard. 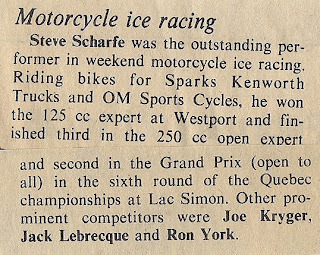 I was fortunate enough to race with some of our Canadian greats , especially on the national ice racing circuit. 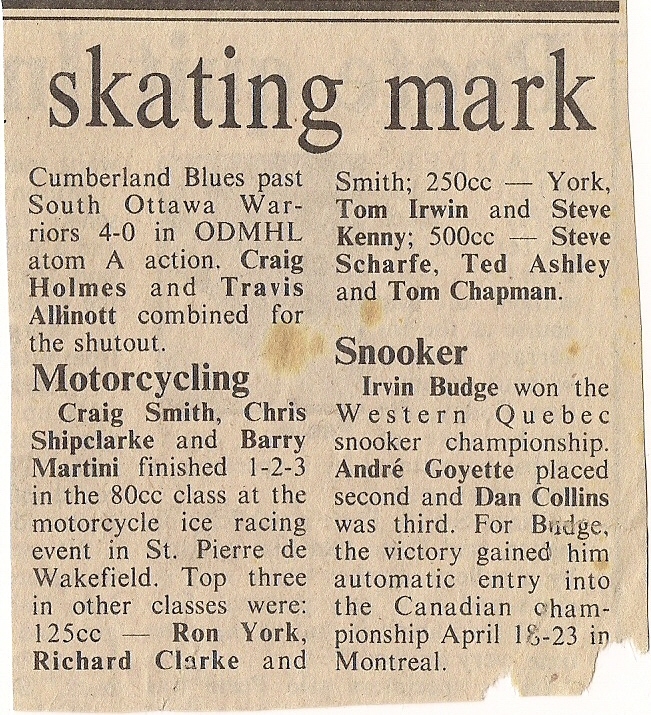 I came across an old CMA ice racing national result mailing from 1979. 1970, I'm 17 yrs old. 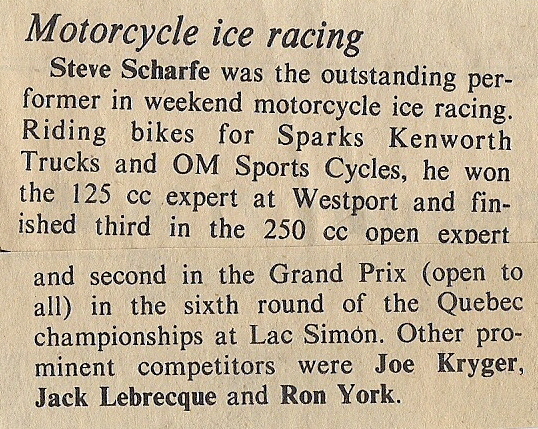 The names mentioned in the top 10 out of 22 riders in the Open Expert class are well known in Canadian motorcycle racing. But.....that was a long time ago so, I should say some of the names were well known . 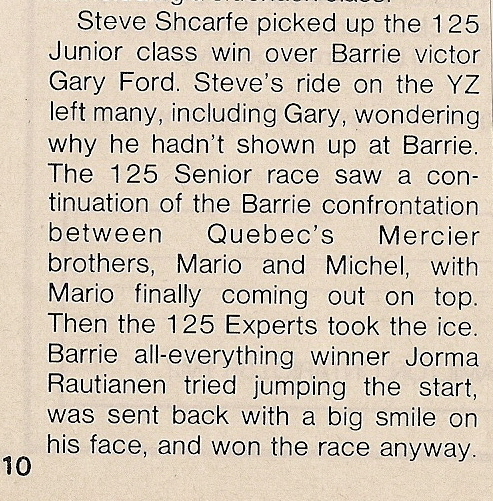 Finish positions were: 1-Michel Mercier, 2-Mike Kelly, 3-Jon Cornwell, 4-Tom Braithwaite, 5-Paul Corriveau, 6-Steve Scharfe, 7-Rick Gunby, 8-Cam Whiffing, 9-John Parker, 10-John Menzies . If any one remembers any of these names, I would like to hear from you. 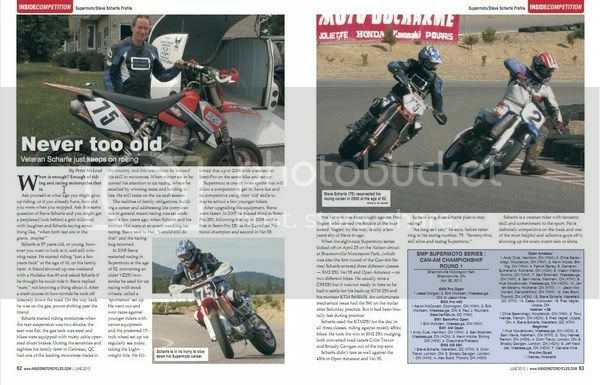 I am so fortunate to have tried racing Supermoto in 2005 at age 52. I hope to race in this sport as long as my legs can clear the seat and other parts can clear the jumps. I hope to have the conditioning to ride 3 classes in 2011. I managed it a few times in 2010. I want to thank all the people who have helped me be able to live this dream. CMA magazine article by Casey Cyr 1975. I had shown up early and was told the race would be cancelled because of bad ice conditions. 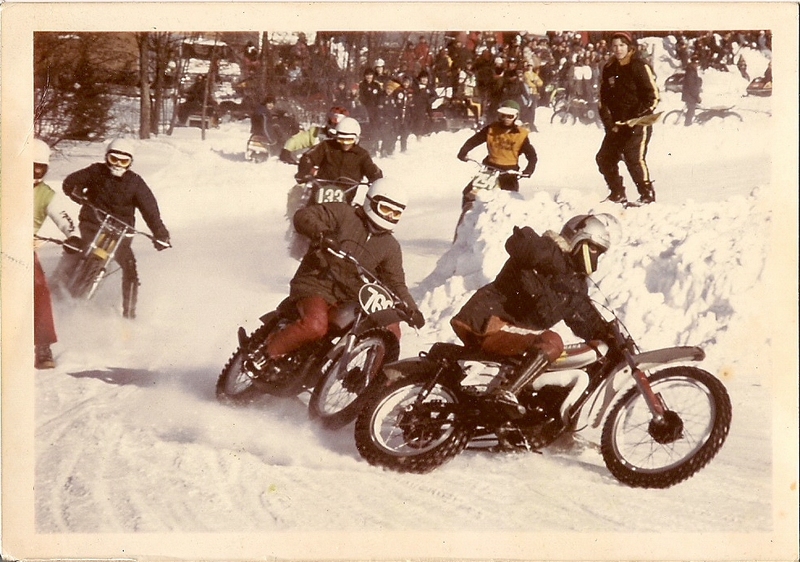 I left, and as I found out later, everyone else raced on ice and mud. It pays to be late some times!! 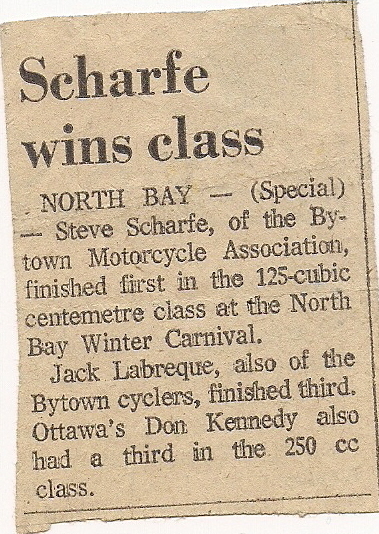 North Bay Carnival National race 1975 YZ 125. 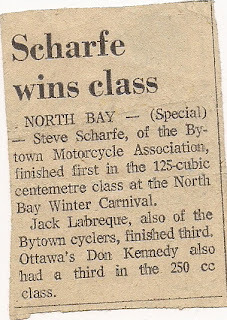 Was paid $35.50 for first place 125cc. 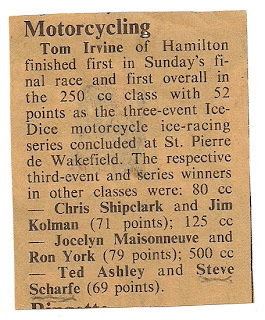 1979 TT 500 placed 1st overall in open expert, in a 3 race series, I put on in front of a jammed packed Hotel sur le Lac. We partied and jammed with the house band till 10.30 after the presentations. 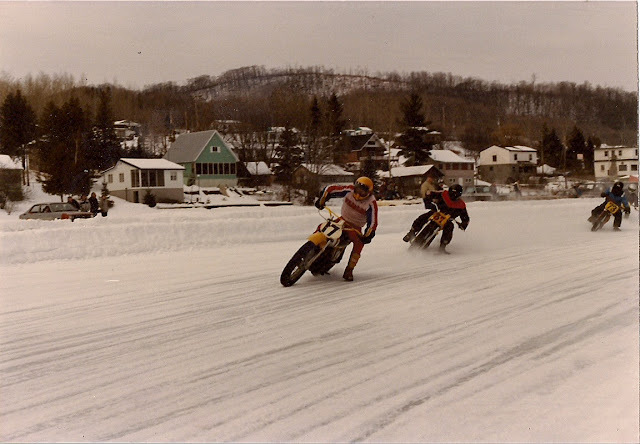 Three Americans who raced in the 500cc expert, said it was the most fun they ever had racing. 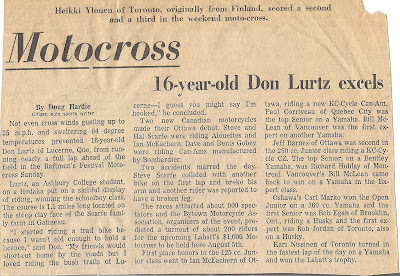 Title should read 16 year old Dan Lurtz. I broke my wrist, when the rear wheel disintegrates after hole shot into first turn. 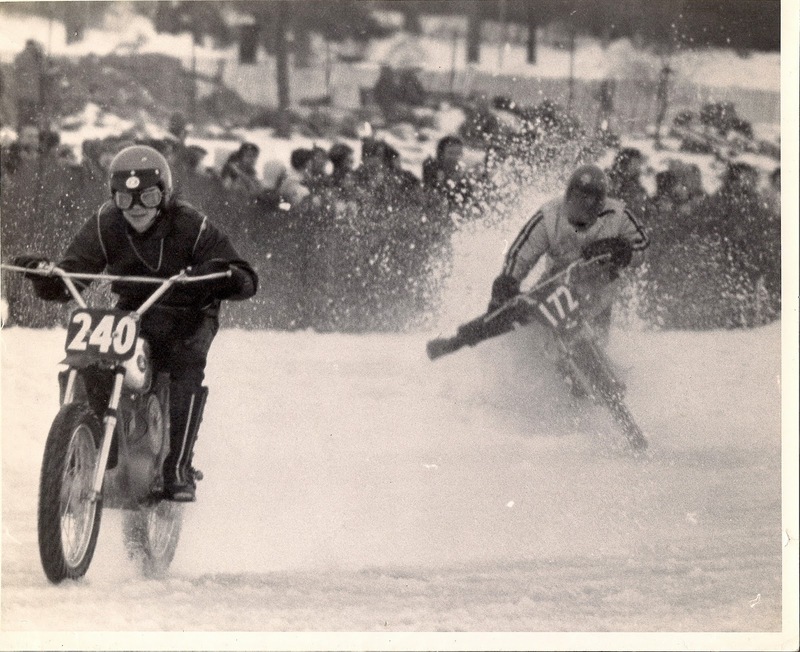 I go down sliding to a stop, everyone close to me, 40 plus riders easily miss me except for the guy in dead last. 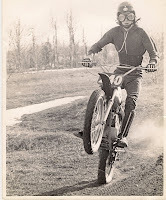 He probably thought my back brace made a perfect jump to clear the cross furloughs that twisted the wheel on the Alouette AX125. 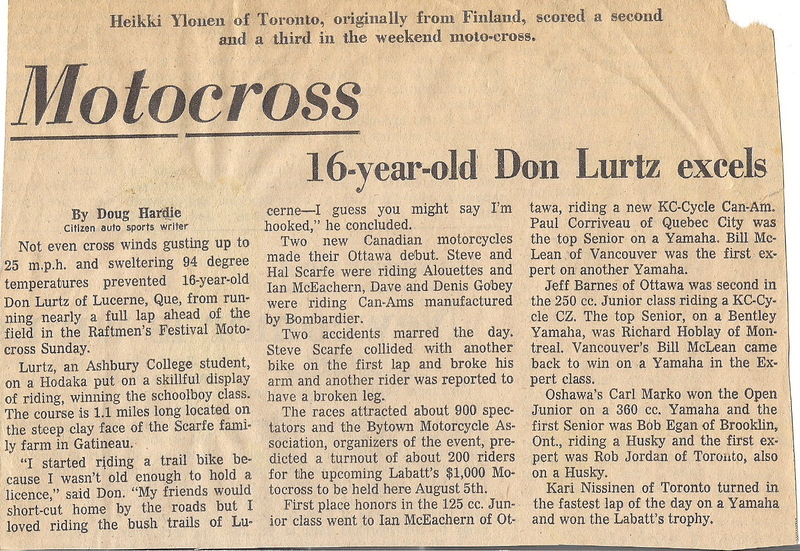 I was only supposed to ride my YZ360 in the open Junior class, as a 4th place finish gave me the Canadian Nat title. 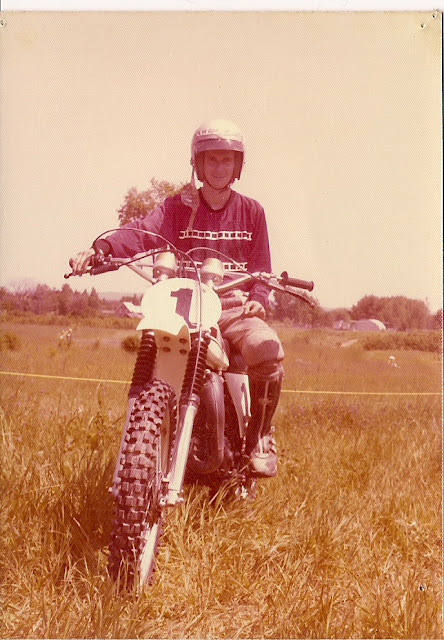 I rode the Alouette that day only because the rep told me I would have a sponsored ride next year, and also let my brother Hal ride in his first ever motocross race with the 2nd bike he had. As it turned out, Alouette went under. 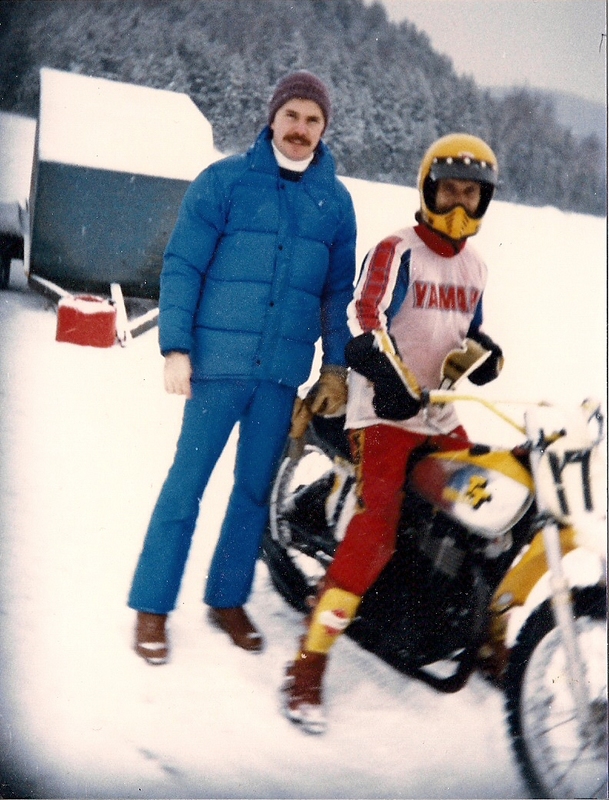 I was told later that Yamaha was going to make me an offer,but when I threw the Championship away by riding and crashing another bike they were not impressed. I thought then, that marked the end of ever grabbing a National title. 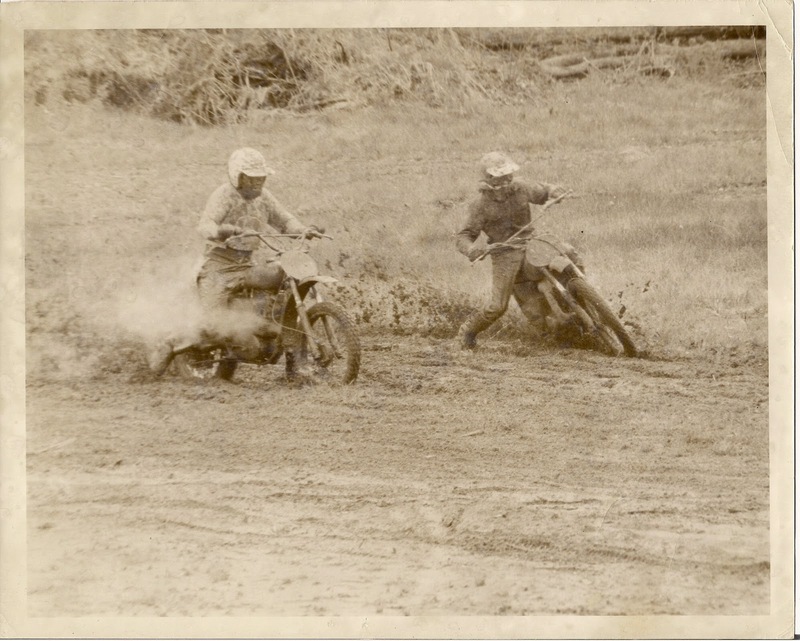 Passing Don Kennedy riding a 1973 YZ Yamaha 360cc pinned on the outside in mud race at Sandelee motocross track. This was the most demanding weekend ever. I flew to Moncton NB to pick up a brand new Kenworth tractor trailer for my sponsor Sparks Kenworth. i drove all night long on the most brutal roads to arrive in Ottawa just in time to be picked up By fellow racer Joe Kroger. 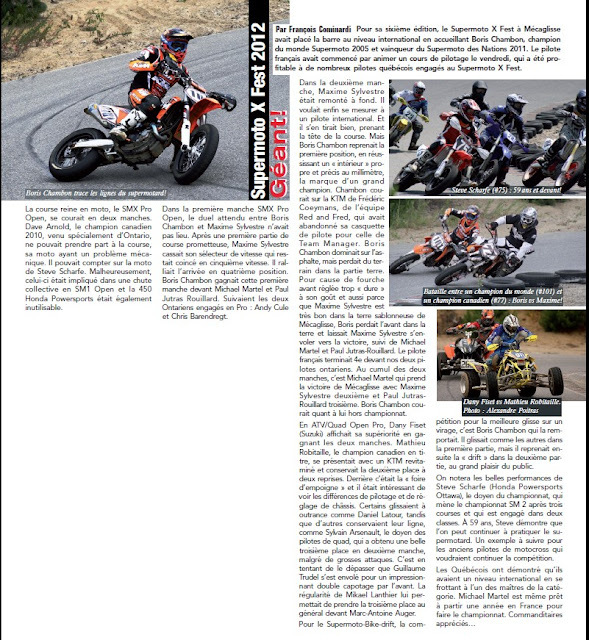 I raced two classes, 125cc and 250 cc with my 125, plus!! 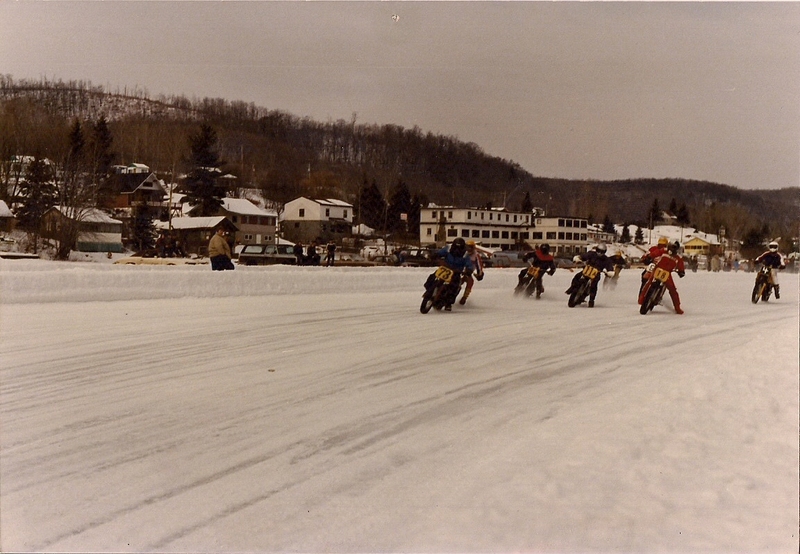 a foot race with motocross boots on. I remember leading untill the long legs of Mike O Riley made the pass, oh the burn was crazy. 2nd place, got a t shirt. We then headed to Lac Simon QC. 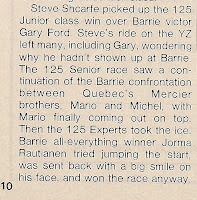 to race the Quebec provincial round. 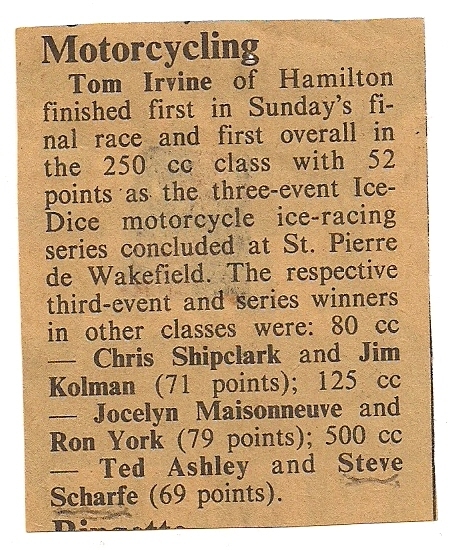 Raced two classes 250cc and open 500cc. Just 6 hrs. sleep in 3 days. Have you ever see things cross the rd. that are not there? The Americans Ted Ashley, and Tom Chapman dynode their engines every week. They were always showing me a wheel if I was in front.